The lord is in Bhujanga sayanam and one can see the stalk of the lotus flower rising from Lord's nabhi (navel) and joining with the lotus flower on the wall where Brahma is seated Lord's Thirupadam can be seen through a side window.A Brahmin named Yagna Sharma who became a demon cue to the curse of one of Vashista"s sons regained his form due to contact with the Lord's feet.Also Indra was relieved of Brahma hatya Dosham at this sthalam. Thaayaar - Malarmagal Naachiyaar, Poomagal Naachiyaar & a utsava Thaayaar, Puliangudivalli. Theertham - Varuna Theertham, Neeruthi Theertham. Features The Vigraham(Idol) of the moolavar is being carved very technically even in those days. Those should be noticed. Access to the temple About 2 miles from Sri Vaikuntam towards Tuticorin. 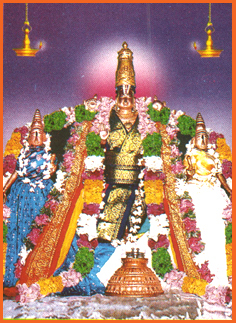 The Moolavar of this Sthalam is Kaaichina Vendhan. Moolavar in Kidantha kolam in Bhujanga sayanam facing east direction. Prathyaksham for Varunan, Nirruthi, Dharmarajan and Narar. Thirupulingudi is approximately 3.5 kms from Srivaikuntam and about 1 km from Varagunamangai. There are no facilities available here.